When we want to create a document that no one can edit, a PDF is the best option we have. PDF format is practically a standard when it comes to sharing files. But it has a really big problem, the professional applications to create PDF files are very expensive. Nevertheless, developments like CutePDF Writer are a great help for those users that don't require great features, but do need to store documents in PDF format. 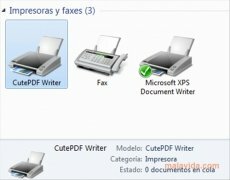 CutePDF Writer, once installed, creates a new virtual printer on the system. And all the files that we send to that printer will be automatically converted to PDF, and stored where we tell it to store them. Thus, any file that we edit with Word, for example, can be stored as a PDF, allowing us to send it without danger of anyone editing it. To tell the truth, the program is completely transparent to the user. It doesn't even have a shortcut in the start menu, we'll only be able to access a Readme. But when we select the printer created by CutePDF Writer we'll obtain the results almost instantly. Requires a PS to PDF converter, like Ghostscript, which is offered after the CutePDF installation.